How Audi’s New Technology is Beginning to an End of Traffic Lights? Vehicles could soon start crisscrossing each other while barely slowing down. Audi has made it public that it will be installing a new feature in most of its new vehicles that will generate a smooth communication between the automobile and traffic lights. The new trick will please its customers; they can watch a timer count down from red light to green. The system is also built in a manner to alert drivers when approaching a green light that is about to change, thus preparing them to start braking. The eventual death of the traffic signs is more than a ploy. The Audi new technology is an indication that the decline of traffic lights may happen so fast. In the real world, traffic lights are not perfect solution for the imperfect environment. They force drivers and motorists to sit when the color turns red, as the other lane turns green, and finally moving when the green light reappears again. Such a system brings congestion on the roads, and the pollution from the idling engines makes it unbearable. In most cases, it is never guaranteed that the person right in front of you will start moving when the light turns green. The new Audi system is a representation of a viable vehicle-to-infrastructure communication. According to Audi officials, the plans are to build and install communication capabilities to its A4 and Q7 SUVs. In this program, five to seven cities in the United States will be availed with the traffic light feature. The technology will enable the infrastructure of the vehicle to communicate with the traffic lights and signals. During this communication, important operational and security data will be exchanged wirelessly to vehicles via the cloud. According to Audi official, the use of the new technology will give a chance for the firm to venture commercially into nascent technology. The technology will reduce the traffic snarl-ups on the main junctions and roundabouts thus enabling motorists to have a stress free ride. Like the vehicle-to-vehicle communication, where cars communicate with each other to smoothen out any traffic pattern, the vehicle-to-infrastructure (V-to-I) is a key technology that will help get a large number of autonomous cars get into the roads. The use of this technology is in the formative stages as some tests are still being done by the respective transportation agencies and the carmakers in the industry. Once put to use, traffic jams and road crashes will be a thing of the past. The Audi’s system has to be very ubiquitous before rendering any traffic sign obsolete. In actual sense, the platform is beginning to an end in itself. The two systems V-to-I and vehicle-to-infrastructure are carmakers attempt to leverage technology. The main goal is to guard the motorist by reducing crashes and decongesting roundabouts and junctions. According to Audi general manager, Palm Malhotra, this technology is the best innovation strategy for the company. 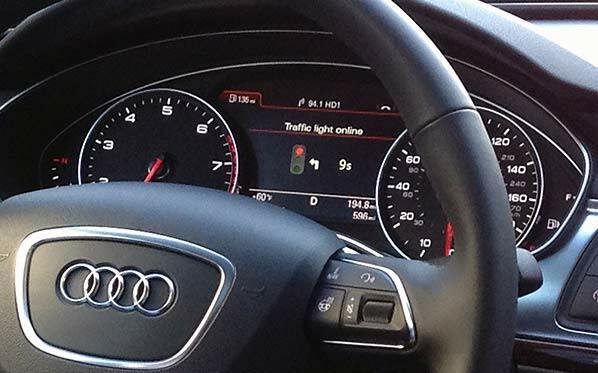 Audi new technology allows motorists to monitor time movement on a countdown. The countdown will indicate the time left for the light to turn from red to green; this reduces the motorist’s anxiety of waiting. The same countdown will appear on the dashboard of a vehicle; this will mostly happen if the system determines that the driver will not be in a position to make to an approaching light before it turns red. The significance of this is to prepare the motorist psychologically to start applying brakes. He further argues that the main design for the system is not for safety only but also for comfort too. Going forward, other benefits like reduced stress levels, saving time will soon be realized. As the driver waits for the green light to show, the system display on the dashboard will disappear just some few seconds before the lights turn green. Such a notification is necessary as it allows drivers to monitor the intersection and determine the appropriate time to proceed. The overall benefit is that time will be saved, and crashes will be avoided. Rolling out the v-to-I and v-to-v technology may be challenging regarding resources. These systems require sophisticated and secure communication infrastructure that is easy to monitor. The municipal council, or any other corporate body that mans the traffic signs and lights must be brought on board. All the stakeholders have to cooperate; failure to do this may create catastrophic scenarios in most intersections. The future use of this system may end up linking it to the start/stop function or the vehicle navigation settings. Another possible use may be where the system advice the driver to maintain a certain speed in order to match the traffic flows and that of the traffic lights. The company is set to roll out the plan in at least five cities, with each being switched one after the other. The company remains lip-tight on the specific cities that it will use to try this venture. The Audi new technology is one of the best innovations in the motor industry. Its use will save resources, save the lives of most people and reduce the stress associated with unending traffic snarl-ups. What iPhone X For $1000? Chill! It’s Definitely Worth The Price!